A rotator cuff injury can be incurred by the repetitive swings motions in golf. A rotator cuff injury is an injury or damage to the tendons and muscles that connect your upper arm and your shoulder blade. This type of injury is often caused by repetitive arm or shoulder motions, or from falling. The Mayo Clinic has compiled information helpful in treating your rotator cuff with exercises and other lifestyle changes. Rest your shoulder after your injury, or when you notice signs of irritation in your rotator cuff. Don't try to exercise during the first week that you have injured the area, or it may become worse. Apply ice right away and for the first couple of days after the injury. After a few days, switch to hot packs for the remainder of the week. Begin exercising after a week has gone by since the injury. Lay on your stomach on your bed, with your arm hanging over the edge of the bed. 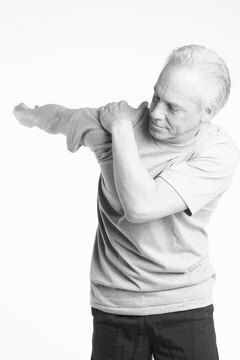 Slowly bend your arm at the elbow until your hand is at your shoulder, then slowly put your arm back down. If this is comfortable, add a light weight. Standing with your arms straight down, slowly lift your injured arm away from your body, keeping your elbow straight. Then slowly release. If this is comfortable, you can add a light weight. Ask your healthcare provider for other exercises that you can do, including exercises for both arms to strengthen your rotator cuffs to prevent future injury.